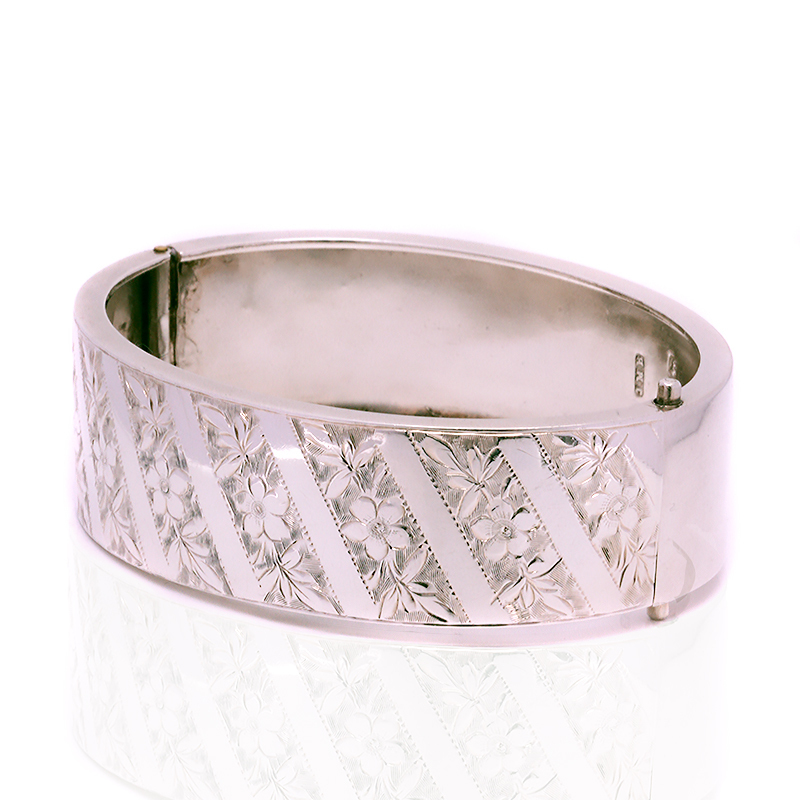 Product code: ES7905 Categories: Sold Items, Sold Jewellery. Here is a very beautiful antique sterling silver hand engraved bangle made in 1883 that looks as elegant and refined today as when it was made well over 130 years ago. Made by the jewellery firm JM Banks, this antique bangle incorporates and ingenious clasp system, whereby pressing the two side buttons will release the catch and allow the bangle to open and fit securely on the wrist. Being hinged will allow it to sit nice and close to the wrist and the internal size is approximately 6.1cm across. Measuring 18.5mm wide the hand engraving is not only so beautiful to admire, but a real testament to the time and quality of jewellery that was made during the Victorian era, and shows how beautiful hand engraving is when compared to modern machine engraving. With such a tactile feel to it to the touch, this antique bangle can so easily be worn all day and well into the night and continue to look so elegant. Tags: Antique bangle, Antique silver bangle, Antique sterling silver hand engraved bangle. This hand engraved bangle was made in the Victorian era. JM Banks, was founded by John Millward Banks in 1863 in Birmingham with the workshop at 6 Northapton Street Birmingham and their showroom at 12, 14 Beake Street in Regent Street in London. They continued to make fine quality jewellery and flat ware until closing their doors in 1926.